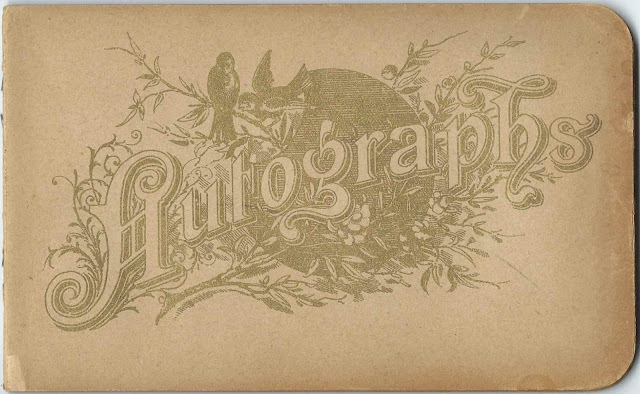 c1892 autograph album that belonged to a Lottie, who was a student at Vernon High School at Vernon, Michigan. In lists of students in the various classes, handwritten by Lottie, the only Lottie listed was Lottie Mattoon. If you have ancestors who were of high school age in the early 1890s, their names should be on Lottie's lists, which are shown farther below. The album measures approximately 6-1/4" by 4" and contains the names of Lottie's schoolmates and the individual sentiments of 13 of her school friends and - in the only entry beyond the early 1890s, an inscription from 1923 from " Your Loving and Only Daughter, Alma", Lottie's ward Alma Green. 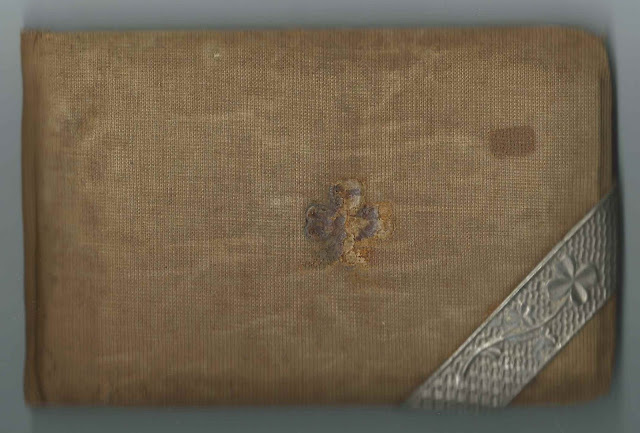 An alphabetical list of the inscribers, together with any personal information they offered, appears at the end of this post. E Elsworth McIntosh  Wiliston ? Lottie Lavina Mattoon was born June 27, 1874 in Michigan, the daughter of Col. Gershom W. Mattoon and Agnes (Lindley) Mattoon. On March 2, 1898, Lottie married Allan John Goodall, an Ontario native born July 13, 1873, whose parents were Allan J. Goodall and Margaret (Fordyce) Goodall. The younger Alan's birth name was Allan Henderson Goodall, as Ontario birth records show, but he gave his name as Allan John Goodall, Jr., on his World War I Draft Registration Card. Lottie and Allan farmed at Shiawasee, Michigan. 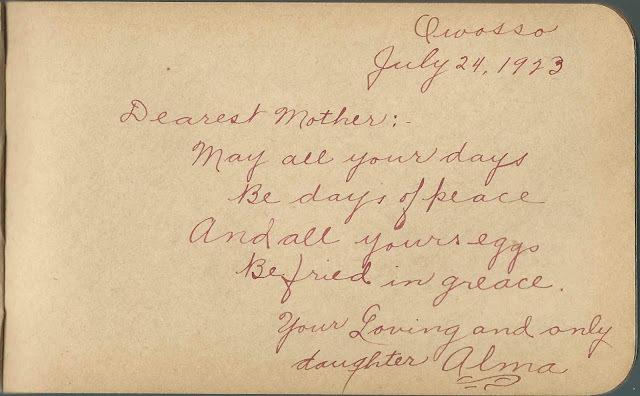 I didn't find records of any children for them, but in 1920 they had two wards in their household, one of whom, Alma Green, inscribed the page shown below in 1923 at Owosso, Michigan. I found online the obituary of Basil J. Flynn, whose first marriage had been in 1929 to Alma Green Goodall; sadly Alma and their son died in childbirth in 1931. Lottie Lavina (Mattoon) Goodall died in 1952, and her husband Allan in 1958. They're buried in the Greenwood Cemetery at Vernon, Michigan. 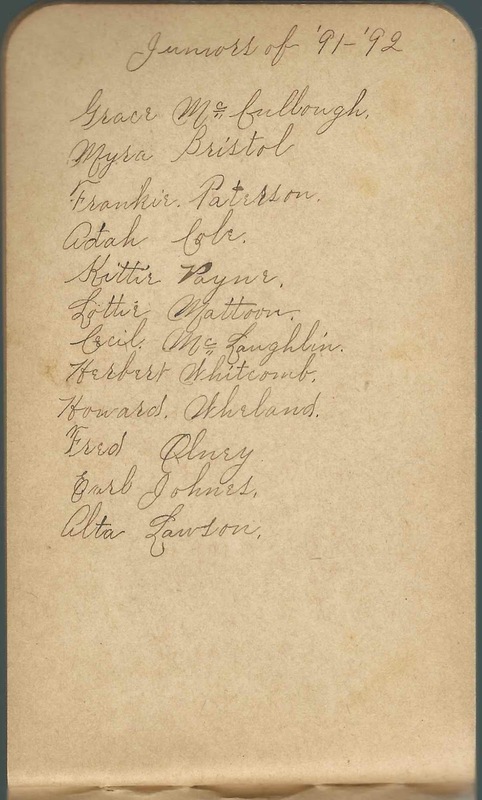 Lottie's list of students at Vernon High School at Vernon, Michigan - make allowances for her sometimes incorrect spellings. Ada Belle; inscribed at Vernon, Michigan; inscribed on February 2, 1892; possibly Ada Cole? Kittie Belle; inscribed at Vernon, Michigan, on February 2, 1892; possibly Kittie Payne? Alma; inscribed at Owosso, Michigan, on July 24, 1923. Lottie's "Loving and only daughter"